Note: This is the second in our new series of posts highlighting new work by scholars in our field. This essay first appeared on the University of Toronto Press site. 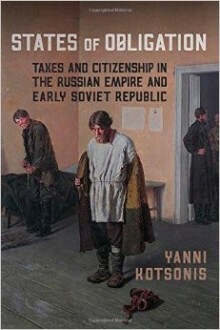 Yanni Kotsonis is the author of States of Obligation: Taxes and Citizenship in the Russian Empire and Early Soviet Republic. States of Obligation is the first sustained study of the Russian taxation system, the first to study its European and transatlantic context, and the first to expose the essential continuities between the fiscal practices of the Russian Empire and the Soviet Union. I love to study Russia because it cautions us to avoid the easy contrasts. Most people would think taxes and Russia, and then think beatings, unfairness, repression, burden, squalor, and an overbearing state. That’s plain wrong, certainly in the early twentieth century, and it does not begin to tell us how Russians experienced and recall their own history. Russia developed a complicated and modern system of revenue, based on taxing incomes in the cities and commerce, which in turn was based on surveillance and reporting. Most of the system had little to do with violence, and it was becoming more fair. Until 1914 or so, you could scarcely distinguish between the Russian, German, French, and British systems because they were all based on each other. They required a close relationship between the state and the economy. What happened next in Russia was really different: using the tax system not to monitor and tap into income, but to statize the entire economy. So I am asking how it was that the same kind of system produced very different outcomes. Two things: where the Russian state got its money, and how the western systems operated. We were all trained in college and graduate school to believe that peasants paid most of the taxes in the Russian Empire, and when I did the math toward the end of the research I realized that the overwhelming share of the state’s revenue came from commerce, industry, and the cities. This led me to my second revelation, that the urban system of revenue was modeled on western examples, mainly Germany and Britain, and I began to understand how much of this was based on discipline and information and hardly at all on coercion. The tax systems of the modern world are amazing feats of modern government, where we make our payments seemingly voluntarily as good citizens, and at the same time realize that we have no choice. It’s not far from modern government as such: a certain illusion of liberty, a certain voluntarism based on having no choice. Sure, lots of visits to the archives and libraries in Moscow and St. Petersburg, which are in really good shape and which had scarcely been used for this subject. I was covered in dust and taking breaks to get over my coughing fits. Everyone thought taxes were boring and quantitative, but I came to study them as modern government and political economy. Russians at the time saw them that way and they left behind some really amazing writings about the philosophy of taxation. I hadn’t quite realized that there was such a thing because the whole matter was measured as numbers and effectiveness, which really was boring. But back then economists were thinkers. I also spent time in Russia’s far North, where the archives are well preserved, and I got a lot of material on how the system worked locally. Again, I was the first to see these things. Lots of Chandler and Hammett, and the current Greek novelist Markaris who writes mainly about the corrupt and nouveau riche generation that followed the dictatorship, the ones who led the resistance and then made lots of money with financial instruments and state contracts. They usually get murdered in complicated ways, which is gratifying, but the murderers tend to be impure themselves. All very noir. Just now, I read dystopias, which is not surprising given that I was reading tax codes and finding them fun; it was either that or psychotherapy. I still can’t get enough of Zamyatin’s We, which is the raw rendering of 1984, or the Bernie Gunther novels – he’s a Chandler-like gumshoe in Nazi Germany. When I take a break from books I have a lot of time for anything dystopian and post-apocalyptic on television. Even when they’re terrible, and most of them are, it’s fun to figure out what makes it terrible and they may have good writers or even plots. Try “Revolution” on broadcast TV, which was cancelled as an act of mercy but had a splendid plot. Russian and European prison systems. I just finished looking at taxes as a microcosm of Russia and any modern state, so prisons seem like a lot of fun to me. We have lots about the Siberian exile system, but prisons were a separate category and were treated by Russian officials as the model of social improvement and human betterment. It started with Catherine the Great who thought of imprisonment as correction, until it came to Pugachev and she had him drawn and quartered. The first Panopticon was built in Russia by the Bentham brothers, but it was a factory, not a prison, which tells us a lot about work and social control. Makes me wonder: was the factory the model for the prison, rather than vice versa? We look at surveillance as something experienced by others – prisoners, Swedes, and North Koreans, say – but at their root they are forms of modern existence to which we are introduced when we get jobs (certain open-space work environments, emails that can be read by our employers) or which we sign on to voluntarily (Facebook, or the “agree” tab when we download new apps). Forget the NSA, we surrender our privacies on a daily basis. We tend to take the dark sides of modernity and place them in countries like Russia, but there’s a good deal of hypocrisy: we’re living it ourselves, and if we don’t even realize it, it tells me that we’re more effective at it. Anyway, as I was finishing my book about taxes, I was following the career of the guy who helped draft Russia’s income tax as an information-based, inescapable claim on the citizen, and it turns out he was the director of prisons. It made perfect sense to me. Again there’s the matter of comparison: the USA has the highest rate of imprisonment, by far, so what exactly are we complaining about? There won’t be an easy answer – we’re not the same, and we’re not different in the ways we thought – and it will be fascinating to work through my ideas and materials and tell a plausible story.